You should give early consideration to the need for any demutualisation relief and to engage with ASIC early in the process if demutualisation relief is required for a proposed MEI issue. 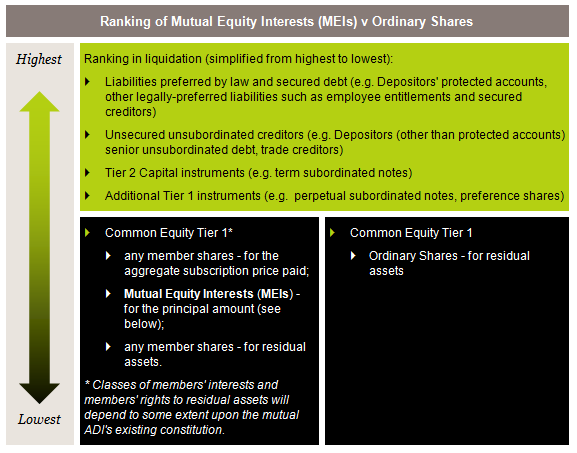 From 1 January 2018, mutually owned ADIs may now directly issue capital instruments for inclusion in the ADI's Common Equity Tier 1 (CET1) capital. Capital instruments qualifying as CET1 may be issued in the form of Mutual Equity Interests (MEIs) that meet the criteria in APRA's revised Prudential Standard APS 111 Capital Adequacy: Measurement of Capital, as published with APRA's response to industry feedback in November last year. APRA will apply the finishing touches to the new rules in early 2018 with minor consequential edits to APS 111 Capital Adequacy, APS 330 Public Disclosure and ARS 110.0 Capital Adequacy. APRA has responded to industry concerns about the previously proposed 15% limit on MEIs by increasing the limit to 25%. The limit continues to apply to both directly-issued MEIs and MEIs issued on conversion of Additional Tier 1 (AT1) and Tier 2 (T2) capital instruments. MEIs in excess of the 25% limit may be counted towards Tier 1 Capital and Total Capital. APRA has retained its overall limit on MEI distributions of 50% of the issuing ADI's NPAT (before distributions are paid). To reflect the equity and strictly discretionary nature of distributions, any reference in issue documentation or marketing material to determining distributions by reference to a benchmark or index must be illustrative only. APRA has no objection to MEIs being tradable and for the issuer to provide a mechanism or platform to facilitate transfers between willing buyers and sellers. At least for now, APRA approval is required for any proposed direct issue of MEIs and so early engagement is advisable. The supporting legal opinion required by APRA will need to address the demutualisation provisions under Part 5 of Schedule 4 of the Corporations Act and any ASIC relief sought for the proposed issue. Any necessary amendments to the issuer's Constitution will also need to be noted to APRA. If standardised documentation is developed, APRA may consider removing the prior approval requirement for proposed MEI issues that are appropriately addressed in the Issuer's ICAAP, including analysis of expected distributions and long term growth. 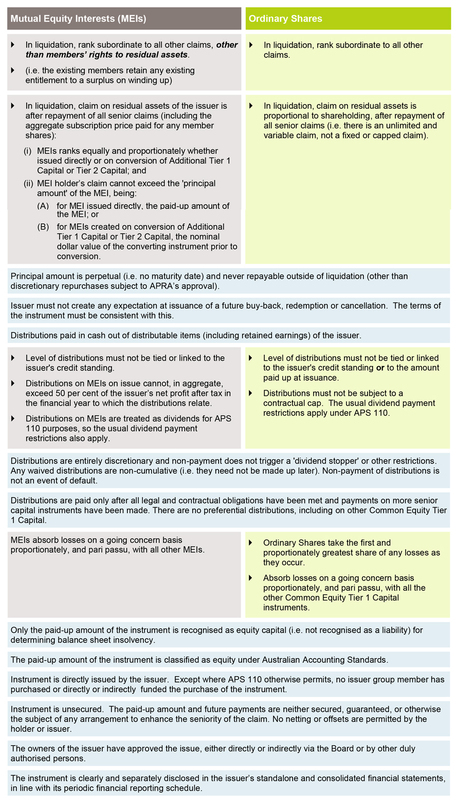 Table 1 below is a simplified outline showing how MEIs may rank in a liquidation under APS 111, in comparison with an issue of ordinary shares. Table 2 below summarises the final requirements for direct issued MEIs under the final APS 111. APRA's changes to the prudential standards follow the Hammond Review recommendations that the Government support the ability of mutually owned ADIs to directly issue CET1 instruments and that APRA give priority to the necessary amendments to its prudential standards. That has now been achieved. the Corporations Act be amended to expressly permit mutuals registered under the Corporations Act to issue capital instruments without risking their mutual structure or status, and to define a mutual company. Potential changes to ASIC processes and any amendments to the Corporations Act may take some time to implement. In the meantime, it is advisable to give early consideration to the need for any demutualisation relief and to engage with ASIC early in the process if demutualisation relief is required for a proposed MEI issue.